"We're not looking for something extra or more than - we're looking for same as others"
Ireland is the only EU country yet to ratify the UN Convention on the Rights of Persons with Disabilities (CRPD). DISABILITY ADVOCATES PROTESTED outside the Dáil today and demanded the government ratify the UN Convention on the Rights of Persons with Disabilities (CRPD). Ireland signed the convention in March 2007 but now are the only remaining EU country still to ratify after Finland and the Netherlands ratified it in 2016. “People with disabilities are getting left behind and we’re fed up with it and not prepared to take it anymore,” said Frank Larkin, who lives with a disability. Such issues are at the heart of what many at the protest feel the government will be pressured to change once ratification on the CRPD comes into fruition. Another protester, Dr Margaret Kennedy, is outraged at the current way the government implements care for disabled people. “I know one woman who was put into incontinence pads at 9 o’clock in the morning and she sits in it till 9 o’clock at night because they won’t give her a home care and PA (personal assistant) service,” she said. She said the government wants to give disabled people home care packages that only cover aspects like washing and dressing. But she says that doesn’t cover the living part of having a life. “We want PA packages where we can go out and somebody can help us do the things we want to do,” she said. 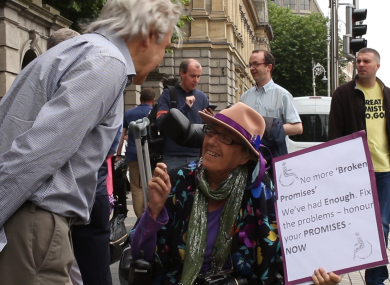 The protesters say the government has failed to live up to previous promises – including the proposed personalised budget in the 2011 Fine Gael manifesto that would help with independent living. Email “"We're not looking for something extra or more than - we're looking for same as others"”. Feedback on “"We're not looking for something extra or more than - we're looking for same as others"”.